Over the next five years, semiconductor units will grow at a CAGR of 9.6%. The analog market will grow at a CAGR of 10.1%. 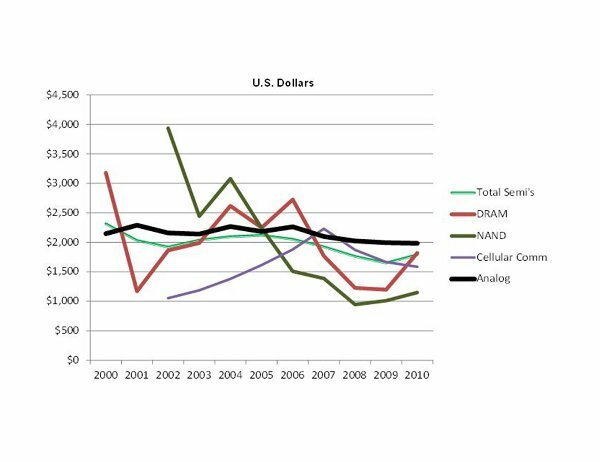 Recently Semico released a report touting the above average growth rates in the analog market as well as the healthy revenue per wafer for analog products. Smart money is moving into power management and other analog applications which have gained in popularity in our mobile electronic world. Over the next five years, semiconductor units will grow at a CAGR of 9.6%. The analog market will grow at a CAGR of 10.1%. Specific analog product categories such as power management devices will grow even faster, logging in a 13.2% CAGR over the next five years. Companies are gearing up for this growth by offering increased fab capacity, more efficient manufacturing and innovative materials and process advances. Although a majority of the analog products are run on 200mm and 150mm wafers, there is still a fab running 75mm wafers and of course, there is the one 300mm fab now being operated by Texas Instruments. The flexibility of analog manufacturing is also exemplified by the fact that many of these fabs are capable of running two different wafer sizes. Looking at the power management market, there are several factors that will make a product successful. New process technology offerings are providing innovative solutions to control power and performance demands. A robust BCD (Bipolar CMOS DMOS) process technology is critical. Many of the foundries offer manufacturing services targeting this market. One example is Dongbu HiTek’s BD180LV 0.18um BCDMOS process. Their process is rated at 30V. This process allows the flexibility to provide the customer with 30V LDMOS with a dense 1.8V CMOS logic. The key to power management is striking the right balance between power, performance, reliability and process complexity in order to provide the most efficient and cost effective solution. The figure below graphs revenue per wafer for analog products along with a few other notable categories. Overall revenue per wafer for analog products has been very stable and is expected to remain stable over the forecast period. Contrast that to the red line which is DRAM revenue per wafer. DRAM revenue per wafer experiences significant ups and downs. It is only during boom years when we see aggregate ASPs for DRAMs increase and revenue per wafer exceeds $2000. The green line represents the total semiconductor revenue per wafer. Note that analog revenue per wafer has been higher than the overall industry except for 2000 when the total semiconductor industry was booming. Figure: Revenue Per Wafer. Source: Semico Research Corp. This phenomenon is not only occurring in the analog world. We see similar opportunities in certain discrete categories, especially those centered around sensors and MEMS. There’s still a lot of life left in those old fabs. If you’re interested in finding out more information about Semico’s recent Analog market report or any of Semico’s services, please contact: Debi Antoni at 623-387-4650 or [email protected].